Have you been looking for an audio player for your toddler? Something that is screen free, with a volume limiter and something that is really robust? We've been using the hörbert and I've been receiving a lot of requests for more affordable options. These audio players (pictured above) meet my requirements but many use new technology and are not necessarily budget friendly. However, they allow a very young toddler to safely and independently navigate audio files like meditation, songs, music and audio books. hörbert - we love the hörbert, it goes with us everywhere. I love the timber frame and the colour buttons which are super easy to use. Each button plays a series of different songs or stories. The hörbert comes preloaded, we chose the multilingual version so you can play it straight away. But you can add what you like onto the memory card. There is a simple on and off switch on the top and a volume knob, which is volume limited. The hörbert is made in Germany and I suggest could be used from 10-12 months+. Jooki - the song or story starts to play when the character is placed on the Jooki. You can also add your own audio files on a memory card and use the Jooki app to make your own playlists. Tonies - this is a very simple and easy to use design. Although the Tonies are not recommended for children under three due to small parts. The child just needs to place the Tonie onto the Toniebox for the audio file to play. You can order different Tonies including music or audio books and there is also a Creative-Tonie in which you can upload your own audio file up to 90 minutes. Also available on Amazon UK here. Ocarina - I've received a ton of recommendations for the Ocarina. This robust mp3 is made in Italy. It has four buttons to do everything and is babyproof! TIMIO - this is fully funded but still available for preorder on Kickstarter. The child places a disc on the TIMIO and presses an image for the audio file to play. It comes with 20 discs including songs, stories and vocabulary discs. CD player - this is a really affordable option and believe me it works. I introduced a CD player to Otis around 18 months (perhaps a bit younger) and he was able to play it, change the volume and flip through songs. The CDs ended up with lots of finger prints on them but it was worth it. I preferred to use a CD player that used batteries so I didn't have to worry about a power cord. Please let me know if you have any additional recommendations, I'd love to hear! Edited to add: A reader suggested the Lunii which is a cute looking screen free audio box, recommended for children 3 to 8 years. It comes with a starter pack of 48 stories!! I really want to try this one too! This may also be a good option for long flights! Does the Children's Dyson Vacuum Actually Work?? I was delighted to recently read that Dyson had made a vacuum cleaner for children that actually works! "The replica design features real working suction, realistic sounds, bright colours, twist and turn action just like the real thing! There is also a removable dustbin at the back to empty the debris." - The Daily Mail (November 2018). Otto is obsessed with our adult's Dyson vacuum. Vacuuming can be difficult because he always wants to use the vacuum. So I brought him a little dust buster. He loves and uses the dust buster but it still didn't compare to the vacuum. It should be noted that Montessori believed in providing children with real tools, tools that work. Montessori from the Start authors do not recommend giving dust busters or vacuums to young children "We do not recommend a vacuum cleaner or Dustbuster, because the child cannot see the mechanism by which they work", they recommend a carpet sweeper which we've used successfully in our previous homes. This Dyson is a close replica of our adult's vacuum (ours is a different colour) and I know that is a big part of the appeal to Otto. It also moves like our Dyson, the head swivels the same and it's fun to use. It is a lot quieter and lighter than Otto's dust buster. Otto absolutely loves it and on the first night he took it to bed (I removed it as he was getting sleepy). He vacuums with it on and off throughout the day. I can also vacuum without any interruptions. Is there any suction? Yes! When I first started the vacuum I was thrilled to immediately see it picking up dirt and small flecks of whatever from our carpet. Our carpet is short, and I am not sure it would work as well on long/thick carpet or on a shaggy rug. It works well on our kitchen (laminate?) floor. On a dirty area like in our entryway, you could see the vacuum was picking up the mess. The vacuum has two on switches. One that makes the coloured balls go around in the main chamber. This is the 'toy' part. Then there is a smaller switch in the back - Otto is turning it on in the picture above. The smaller switch turns on the suction. Would I recommend the children's Dyson? To children under three who are interested in vacuums, in a home environment, yes! But it's not for a Montessori school, it still has a toy feel and children over three may be looking for something more. It is also quite small in size, Otto above is only 17 months. It's not going to pick up a large mess, while our collection chamber (below) does fill up its mostly fine flecks of dirt, small food crumbs, and lint. There is also this fantastic-looking hand-held option (look at the video in the reviews to see the suction). In the UK, we found the best price for the children's Dyson was at Argos (£19.99). 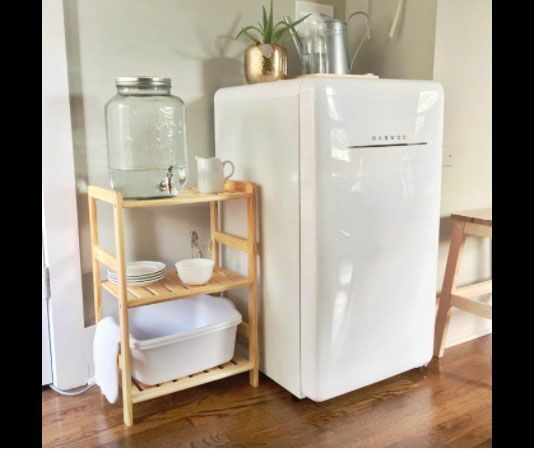 This is one of the most inspirational, affordable, easy and space saving ideas I've seen. When it comes to the Montessori bathroom we often see parents use step stools for the children to access the basin or they provide a care of self-station with a low basin, perhaps a tub in a low table. Our bathroom is tiny and at 17 months I can't leave Otto's side when he is on the high step stool. He loves playing with water and will spend a lot of time brushing his teeth and washing his hands, I don't want to stop him or put barriers in his way. The basin on the bath is the perfect solution. He doesn't have to ask to use it and it requires minimal supervision. It's safe, Otto can't fall. It's space saving, it fits on the edge of the bath it doesn't take up any floor space. It's affordable, ours was around £17, it's made in Germany and I was so surprised to find the plastic is quality and it is recyclable. It's super easy for the child to use. It works! Before it was mentioned on the Montessori Family UK Facebook page, I don't recall seeing this type of children's basin before, it's worth joining Montessori Facebook groups, especially those that are local to you, you don't know what you'll discover. I went searching to see if anyone else had used the basin on the bath and found this fantastic set up at Midwest Montessori. In the UK we use the Babydesign Kiddy Wash (here in France, also at Oxybul) (BTW the mirror is a sticker and it isn't the best mirror image). There are a couple of alternatives in the US, Amy from Midwest Montessori notes they use this one (although no longer available). The basin on the bath really needs to find it's way into Montessori stores!! It promotes independence in such a family friendly way. If you are wanting DIY options for a basin on the bath have a look at Wunschkind-Herzkind-Nervkind and Schöner Wohnen. It appears this concept is super popular in Germany! !